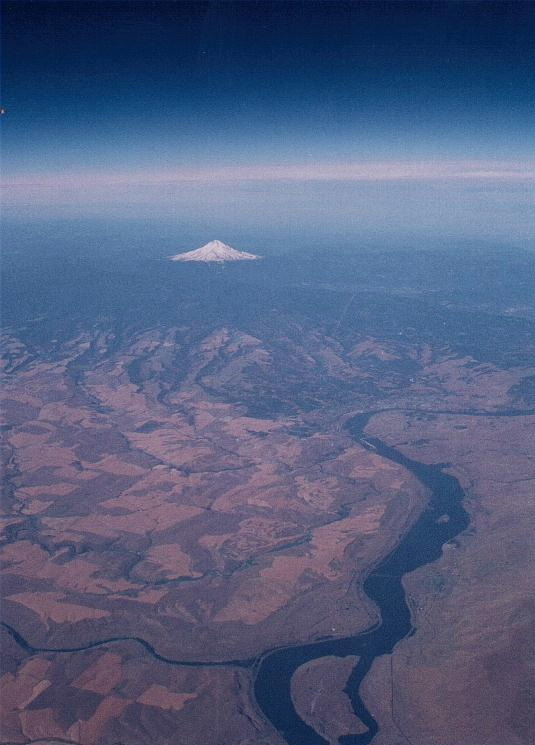 The answer,"Mount Hood". Carnac opens the envelope,"What do the directions of a hood ornament say?" On June 17, I drove a very, very lonely drive from Fayetteville to Evansville, Indiana. I felt soooo low. I lost my appetite, and every time I'd look at someone I'd wish I was looking at Ha--when I heard a sound, I wished it was her talking. No one in Indiana seemed to understand what had happened to me, and my closest relatives made crude, disrespectful sexual comments about Ha. I was floored by how insenstive people were. I'd go off alone in a room and hope no one would talk to me. I felt completely alone in the home I grew up in. As a result, I left a day early, on my mother's birthday, and returned to Grafton, Virginia, where Miimii was still not too happy to see me. There were wildflowers all over Interstate 64, so I stopped my car, ran into the grass median, picked a bunch (which I now know was illegal), put them in a Mt. Dew can of water, and gave them to Miimii when I returned. I wanted to give them to Ha. Miimii didn't say much--we were fighting right off, I was upset, and I finally said,"You didn't even say anything about the flowers I picked for you!" She paused, looked over, and said,"Oh those are mine? Thanks". She was never one to pay attention to gifts I gave her. After that, we got along well for those three days. She finally decided it was silly to live separately. I went to my old office's picnic on June 26, and no one seemed to notice me. I phoned Ha the day before my return to Korea and she seemed happy, content. Brent was back. On June 30th Miimii took me to the Norfolk Airport, gave me a kiss on the cheek, and I flew out to finish my one-year tour in Korea. On the return flight, we overflew over Hell's Canyon, the deepest low-relief canyon in the world (deeper than the Grand Canyon, 7,900 feet) and I was upset I'd checked my camera in my luggage. I'd gotten good at determining location by looking out the window of the an airplane without a map. In 1996, while flying from Virginia to Texas, a storm took us off course, and by visual navigation alone, I found Mom's house in Indiana. So now, at 30,000 feet, I easily followed the terrain to where we overflew Hell's Canyon Dam at the deepest part of the canyon. I'd wanted to visit Hell's Canyon the entire time I lived in Washington State, but Miimii wouldn't go, was too afraid of me going alone, and cried the desire out of me. Now I was there and couldn't even take a photo! Korea was a prison sentence...my heart was in Fayetteville. I wanted to read, ride my bicycle a lot, and learn some things on the computer, but when I returned I found I had to write an Enlisted Performance Report, submit a subordinate for a medal, and oh, by the way, in nine days I'd be sent to New Mexico to play in a Theater Missile Defense exercise at Kirtland Air Force Base! I needed to prepare. I spent the 4th of July weekend in my room, in the dark, trying to write a report on someone I didn't like. Jamie was obnoxious, caused me endless amounts of trouble, and he too had made crude comments about Ha--I didn't like him. I've always been an extremely slow starter on performance reports, despite being a capable writer. I was in the dark, writing for four days. On a bright note, I wrote a creepy poem about my mother called "Mommy!". Then I flew to New Mexico. Enroute, I shot photos of Mt. Hood (top photo), and on our approach to Phoenix, the Grand Canyon (right photo). 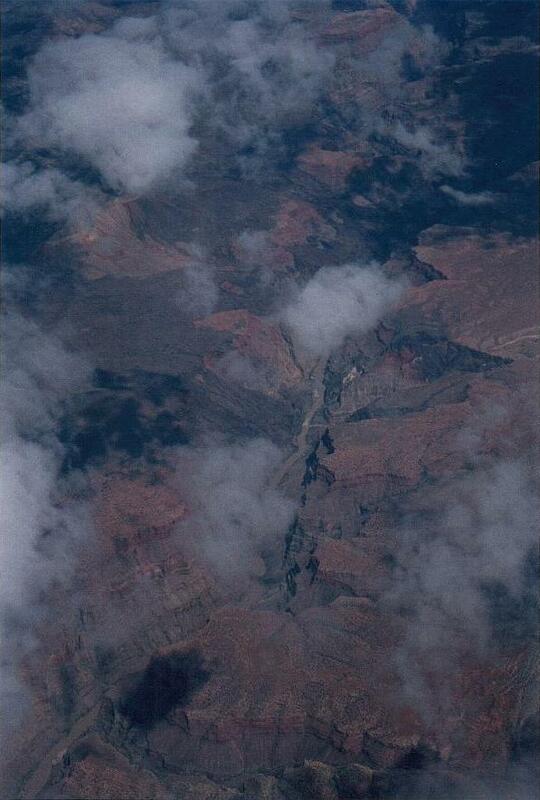 I'd never seen the Grand Canyon before, and now I had a bird's-eye view. But now, this time, I was ready with a camera, and the photomat at Osan liked these photos here so much they displayed them at their store.